Are There Real Cowboys in Fort Worth? 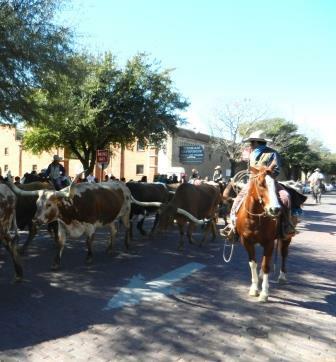 Cattle and Cowboys: The daily signature Fort Worth Stockyard event is the arrival and later the departure of the longhorn herd. I explain Fort Worth as the doorstep to the American West (Which means I must live in the flower pot on the side patio.) and there are cowboys and cowgirls but they do not travel by horseback or even stage coach most of them drive pickup trucks although I do on occasion see a Prius in the rodeo parking lot. For a cowboy fix Fort Worth will not disappoint. The Stockyards is an impressive urban island dedicated to telling the fascinating story of cowboys and ranchers, settlers and cavalry, long horns and cattle drives and the complicated reality of westward expansion. The daily signature event is the arrival (and later the departure) of the Texas longhorn herd. At the Stockyards the unique stories are told interactively engaging visitors in frontier activities. 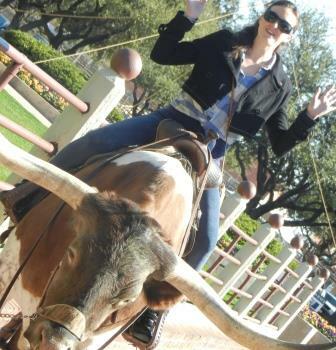 It’s the place to learn to rope a steer or better yet sit atop a long horn. It’s the place to try line dancing or attempt to yodel buy a pair of boots or find the perfect ten-gallon hat; taste a bison burger with fried pickles at Trail Boss Burgers or combine dancing and Texas BBQ at Billy Bob’s. Yes, there are real cowboys in Fort Worth. Nancy Nelson-Duac, Curator of the Good Stuff for the Family Travel Files.